The saints commemorated in the calendar and litany of this Psalter point without doubt to its having been made for an Augustinian house in East Anglia, and this house is very likely to have been Barnwell Priory, on the outskirts of Cambridge. The subject of this initial is not an especially well-known Bible story; it sometimes appears in Psalters to illustrate Psalm 51 because the biblical heading (which appears on this page as a rubric), alludes to the event. 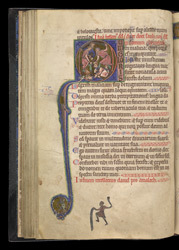 The lower margin on this page shows and early example of 'marginal' illustration, here depicting David with his slingshot, about to kill Goliath.